I have to admit, as the ferry door lowered and Craignure came into view through my car's windscreen, I didn't have the usual feeling of elation to be arriving on Mull. Of course, I was happy, but I also felt slightly apprehensive, as this time the trip to this wildlife-filled island would be for the benefit of four paying clients, who had booked on the first fully-catered wildlife photography tour I had organised with my friend, and fellow professional nature photographer, Andy Howard. 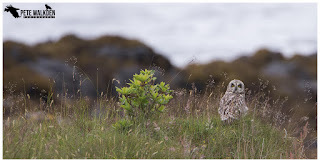 Andy was already on the island, as he had some one-to-one sessions booked with another client, so I had a couple of days to help locate wildlife based on my knowledge of the best spots around Mull. 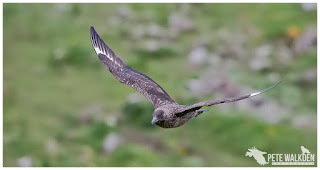 I tend to visit Mull late Summer, as I have a passion for birds of prey, and by that time in the year the young have fledged, and hence there are more around. 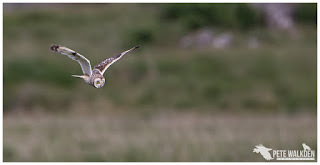 But the same knowledge soon helped me spot some of the species we wanted to show the clients, and I was pleased to see a ringtail hen harrier at one such location. The males remained as difficult to photo as usual for me, though I did watch one bringing food back to some recently fledged youngsters in one of the glens, on a rather soggy morning. 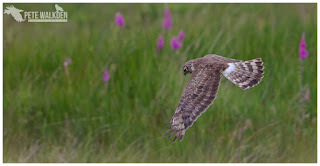 The prey seemed to be a mixture of perhaps pipits and the occasional vole. 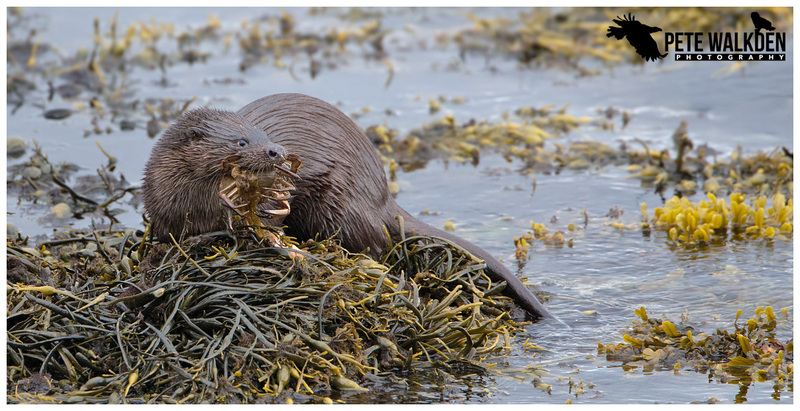 Heading to one of several known good otter sites yielded a great view of one, as it marked its territory on the rocks. 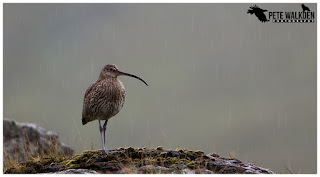 Andy and I spent every hour possible before the first of the clients arrived, searching for wildlife, and it paid off when we found another otter during a downpour. 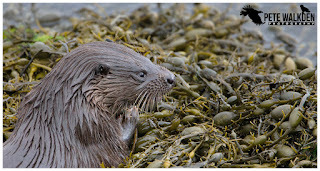 With little breeze, we had to be extra careful with being quiet and still, but even limiting our shots taken and using silent modes on the cameras, the otter seemed to be aware of us being there. The large self-catering farmhouse we had booked was available from mid-afternoon on the Saturday, and it was a pleasant thought to have a roof over our heads after camping for the first few nights. That said, we were both taken aback at how gorgeous the accommodation was, and how spacious - perfect for our clients' stay. With Andy's wife Lyndsey kindly meeting up with us that day to prep the food for the week, and our first client Ruth due to arrive, it was a case of us rapidly getting the house ready and ourselves organised. 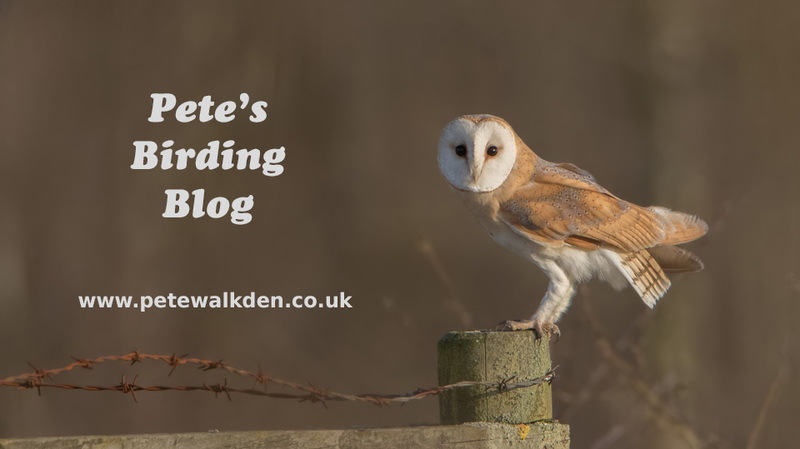 Ruth, a professional musician, arrived shortly after, and I didn't need much persuasion to take her over to the location we'd seen the short-eared owl, while the food was being prepared. 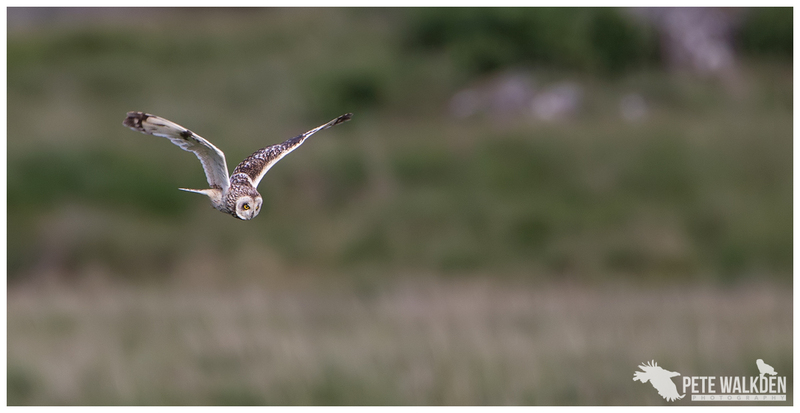 Having never seen one before, she was asking about their appearance in flight, and pointing to a "gull" at the time when I looked and realised she was looking at the owl as it quartered the meadow nearby! The main arrival day was Sunday, and everyone seemed to turn up at the same time. The other clients were Fary (retired neuro-surgeon), John (retired joiner and mountain rescue team member) and Mark (IT Engineer). After a round of introductions over drinks and snacks, we zipped out to see what we might find on the first afternoon and evening of the tour. 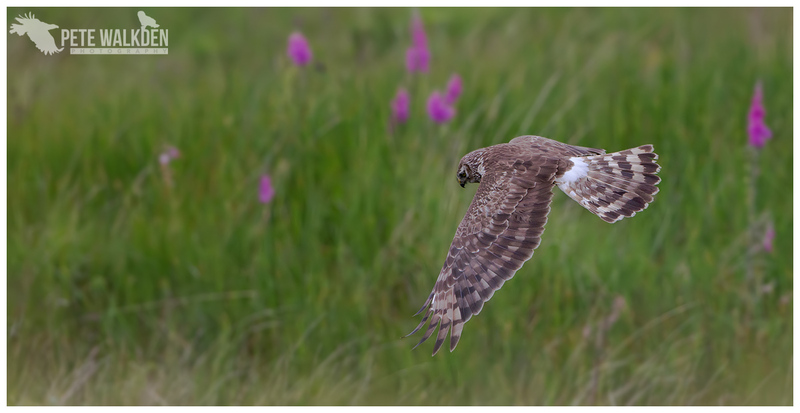 While the otters failed to show this time, we did get to see a female hen harrier rob a short-eared owl of its dinner, dropping the vole in the process, before swooping down to complete the mugging. 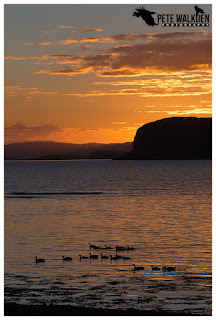 The tour would start the following morning, with a trip to Staffa and Lunga via Turus Mara's boat trip, and we were all pretty excited about it. The weather however prevented us from visiting Staffa, meaning we would have longer on Lunga, which was actually good news for us as photographers. 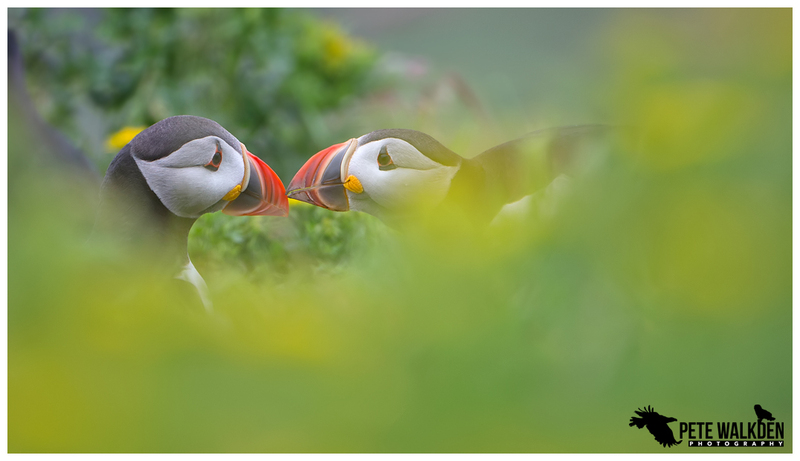 One can never have too long with puffins! Finding a spot away from the crowds (the majority of folks leave after a couple of hours, leaving the island to the photography groups who have paid more to stay longer), we dumped our bags and Andy suggested several types of images to go for, as well as offering advice on how to track puffins as they fly back to the cliffs. It clearly worked as the clients we soon nailing cracking images of the seabirds, whilst occasionally popping back to the bags to nibble on the picnic we'd brought with us. It's a long day so refreshments were most welcome. While we generally stayed around the main puffin colony, there were lots of other birds around to photo, including razorbills, fulmars, guillemots, shags and great skuas. The "bonxies" obviously terrified the smaller seabirds, and they caused panicked waves of them to flee the cliffs each time they approached. That said, despite their presence, and the gulls, ravens and peregrine falcons watching from above, the puffins generally seemed to be having an easier life than their friends down at Skomer and on the Farnes, where they're chased down by gulls on approach. The return sailing was calmer and allowed for a rooftop view, which yielded a brief sighting of a basking shark, followed by several moments watching a pair of white-tailed eagles, plus a distant golden eagle. Not a bad start to the tour! The benefit of having two guides on this tour meant we could have a one-to-two ratio, and as I'd brought some comms along, we could also ensure each vehicle was kept informed of anything spotted by the other one. 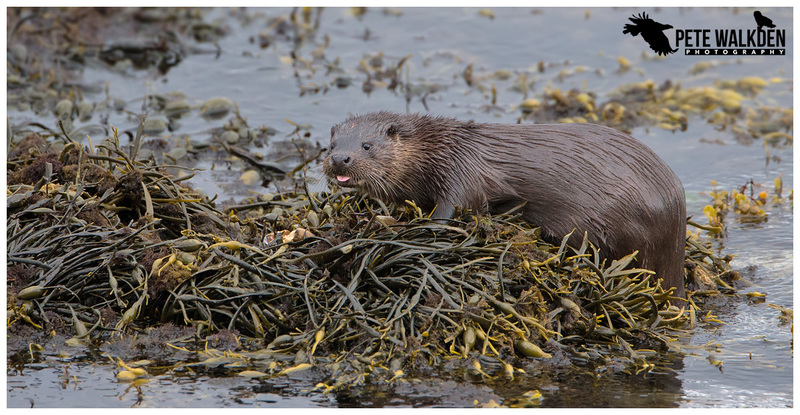 The second day was spent looking for otters, and after dipping at one site, we managed to encounter four individuals shortly after. 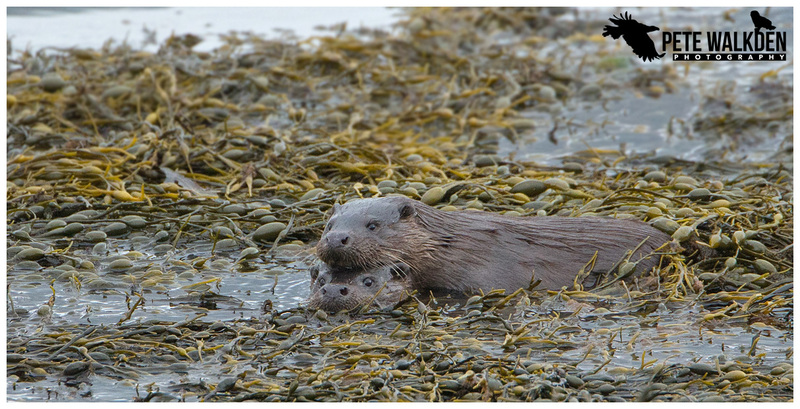 And while they were rarely all together in frame, we did get some good views of a pair mooching around on the rocks. 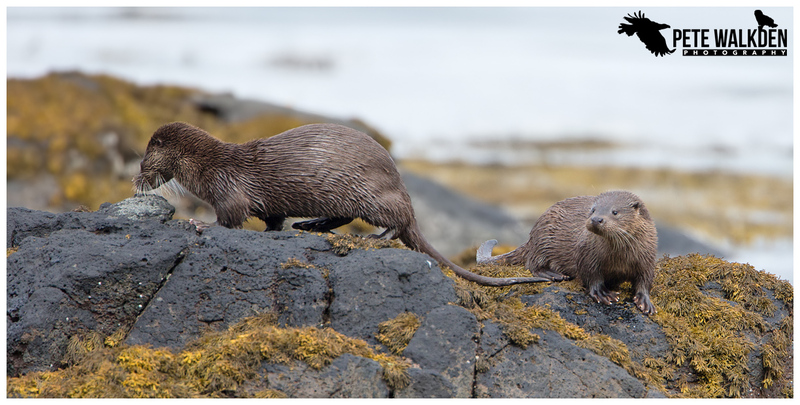 The comms then came into their own again when Andy's group had gone on ahead, and we spotted yet another pair of otters along the coast. A mother and cub, and as I was in contact with Andy, he was able to double back quickly to join us. With favourable conditions to approach, we were soon in position nearby, though not too close, to observe and capture the behaviour. 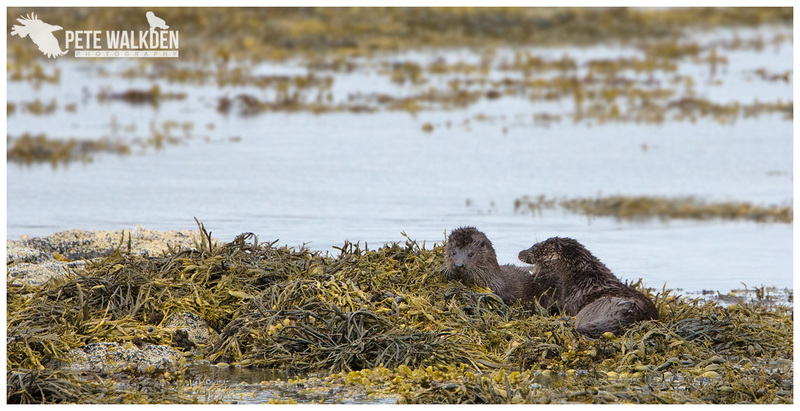 From our position, we watched as they groomed and rolled in the seaweed, with the mother occasionally going off to fish for her cub. He seemed to be enjoying life, and play fighting with her when she returned. 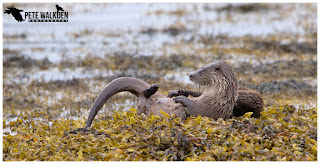 John commented to me that he was surprised at how excited I was whilst watching the action, quipping that perhaps it was the first time I'd seen otters. Both Andy and I tried to express that the encounter was quite simply one of the best we'd both ever enjoyed, so the excitement was hard to contain, and it was pretty clear from everyone's broad grins, the feeling throughout the group was mutual. Amusingly, we were supposed to be visiting Iona that day, but the six otters delayed us by several hours, and we only managed to spend a short amount of time on the island. Andy splashed out on ice-creams for all, and we then set off in search of corncrakes. 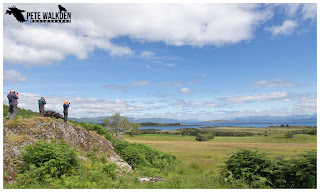 While we heard several, the vegetation seemed to be just that bit too tall to see any, and with time against us, we took one of the last ferries off of the island back to Mull for the drive back home. Of course the drive back was made more enjoyable with sightings of a short-eared owl, followed by some very accommodating barn swallows resting on a barbed wire fence beside the road. 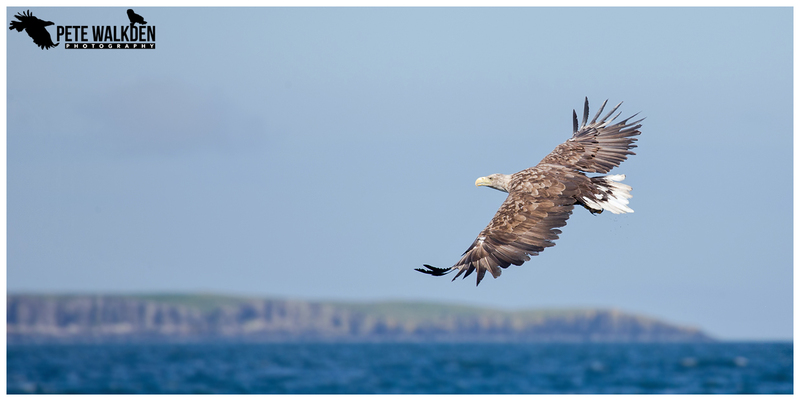 Midweek already, and with a dire forecast for Friday, we rearranged our private session with Mull Charters to be on this evening instead, meaning we would have a practice session with the public trip in the morning, ready for the main event later. 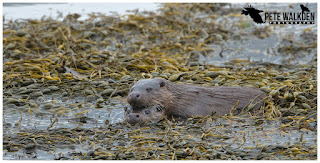 It was good to see Martin and Alex again, and we had great views of otters as we sailed out of the harbour area. Moments later, we were watching a majestic white-tailed eagle approach, and with advice on tracking the bird, and on recommended settings, some of our group managed to get some superb images right from the off. Having witnessed the event, we reviewed the images taken and addressed any concerns raised, and what we said obviously worked, as everyone soon achieved what they hoped for on the next dive. 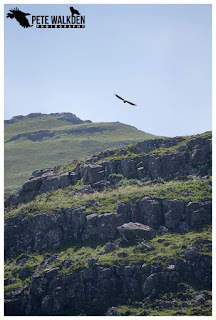 For me personally, it felt strange to be standing back from the action, ensuring our group had the best possible view of the eagles, at the expense of my own. It's not like I don't have many images of these awesome birds though, and just watching them swoop down was a treat. I hoped that the private charter later, with fewer people on board would allow me to grab some more shots later as well. 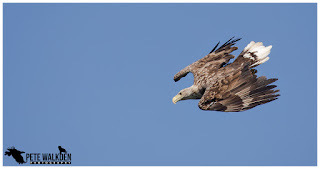 I did take some images though, when the eagles were flying overhead, as they started to dive, and a few as they flew away, so it wasn't as though I was completely detached from the action. We were lucky with the weather too, after a couple of sharp showers moved away, the skies generally cleared which helped everyone with maintaining the best exposures for the shots. The second trip soon came around, and we boarded the Lady Jayne once more. 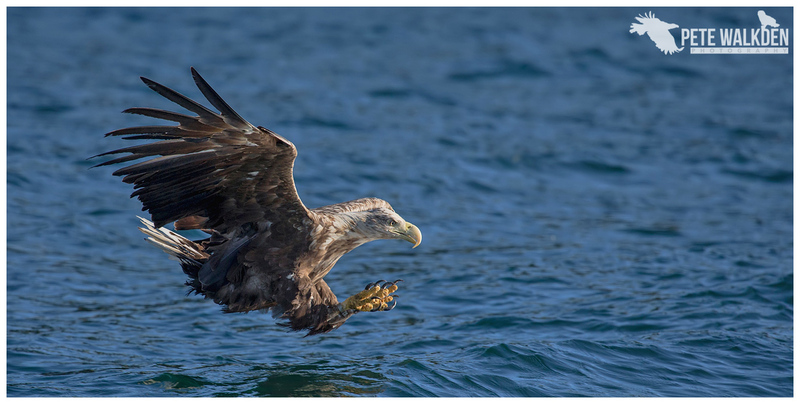 By now the sky was completely blue, and when Martin moored the boat in a calm bay, with the eagles soaring overhead, it was pretty heavenly. The pair soon returned to the cliffs, and after our drinks, we sailed out to choppier waters, where one of those magical moments that happen so often on Mull, surfaced to breathe... a pod of bottlenose dolphins. Even though there were only six of us on board, I still found myself standing back to allow everyone else to get the best views of the dolphins as they swam alongside the boat, and breached from the water all around. Some of the images taken by the group were simply sensational, and I think we all almost forgot we were supposed to be watching for the eagles! That soon changed when the action recommenced, and we had some terrific views of the eagles coming down for the fish. With the smaller group, I was also able to photograph the action all the way through the dives, and added a few more images to my library of these incredible birds. The day ended with another otter sighting, and Andy bagged one of the most gorgeous sunset / silhouette otter images I've seen - benefits of having a 100-400mm lens attached to his camera instead of the big prime I had on mine. 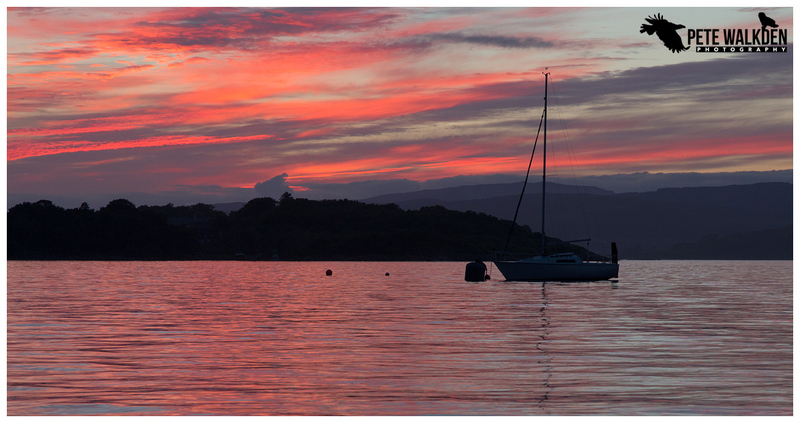 The sunset itself was worth staying for, and so ended yet another wonderful day on Mull, with yet another very late dinner, as had become the norm for this trip! The lovely weather continued the next day, but as I have so often experienced in previous trips, good weather doesn't always mean great days of wildlife. In fact, the wildlife often seems to go into hiding on such days, for me anyway. 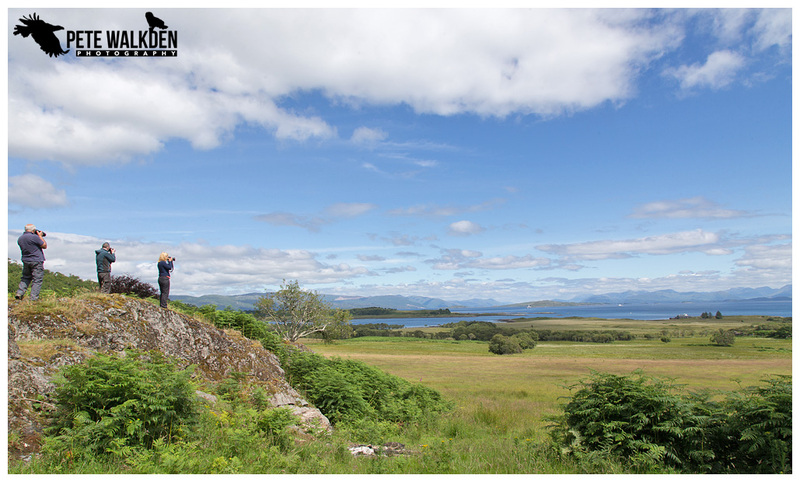 Mull isn't just about the wildlife though, and wide-angle lenses replaced telephoto ones, for imagery of the glorious views to be had. 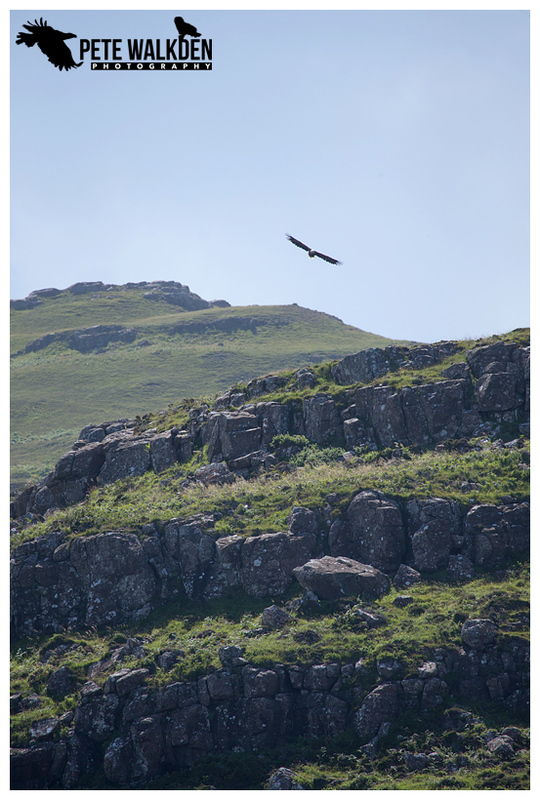 Taking a different route around the island allowed us to visit a site of a golden eagle nest, and using just his ears (closing his eyes) Andy worked out where the nest was, and where the eaglet was hence calling from. The parents passed over a couple of times, before we decided to leave. 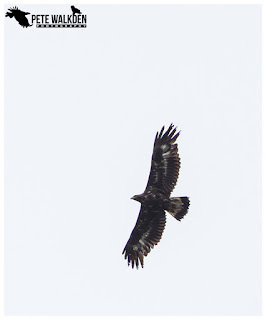 Halfway down the road, we spotted a large raptor low down, parked rapidly and jumped out to get some shots. 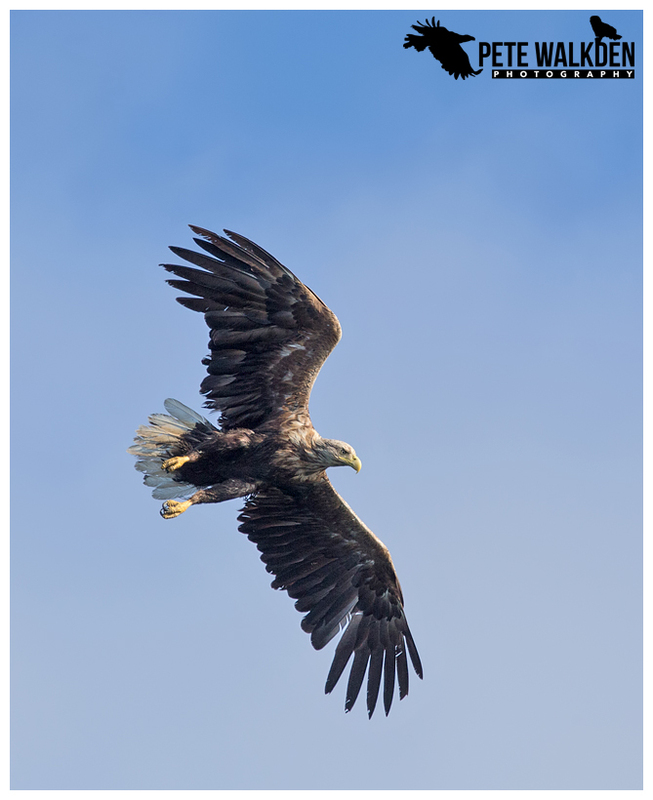 Unfortunately for Ruth, Andy had been using her Canon 7D Mk2 with its cropped sensor for a bit of extra reach to view the eaglet moments earlier, and had left the shutter on a timer release, so when she tried for the shot, nothing happened. Well, apart from some unrepeatable language! For what it was worth though, the eagle was against the sun, so it'd have been difficult to gain anything decent from the image. 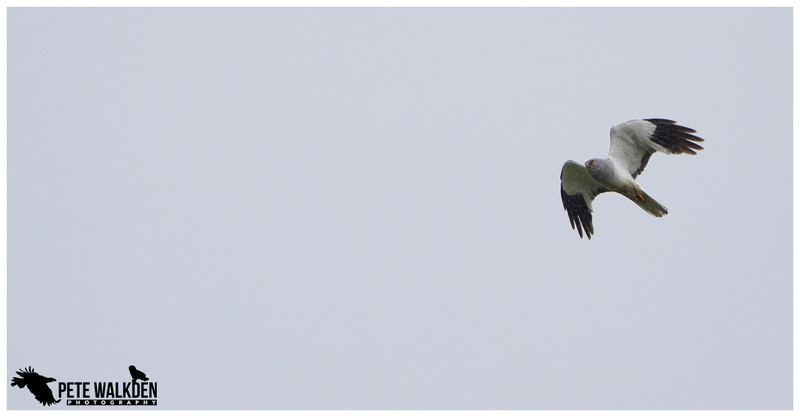 And she soon cheered up when she managed to grab a decent image of a male hen harrier as it hunted over a marsh. Something I was unable to do, as I couldn't get to my camera in time... One day I'll get a shot. With rain forecast later, on our final full day of the tour, we all decided on an early start, and it paid dividends almost immediately, when we spotted the group of otters once more. 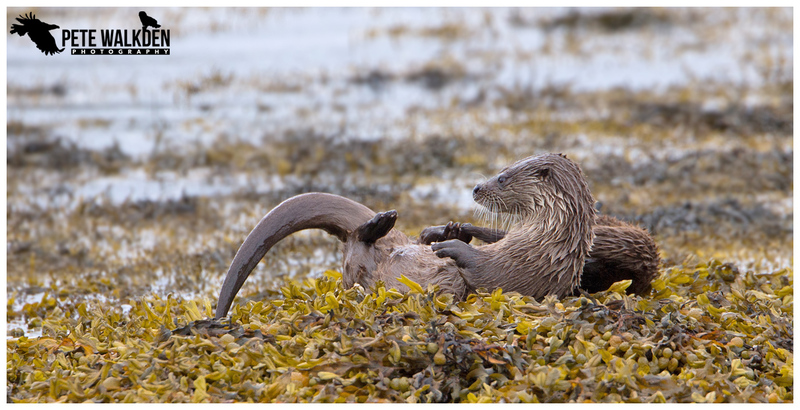 With swirling winds, it was tricky to find a suitable spot to watch from, but manage we did, and were delighted to watch a pair of them play fighting on the seaweed, before going out fishing. With the warmer waters at this time of year, the otters generally consume their catch without needing to bring it ashore, but some of the crabs being brought up to the surface were perhaps too tricky to deal with, so they swam back to the rocks to handle them. While we had decent views, we were really a smidge too far away for anything really good, and when the otter we had been watching went out fishing once more, heading out into the loch, I suggested we catch the others up. 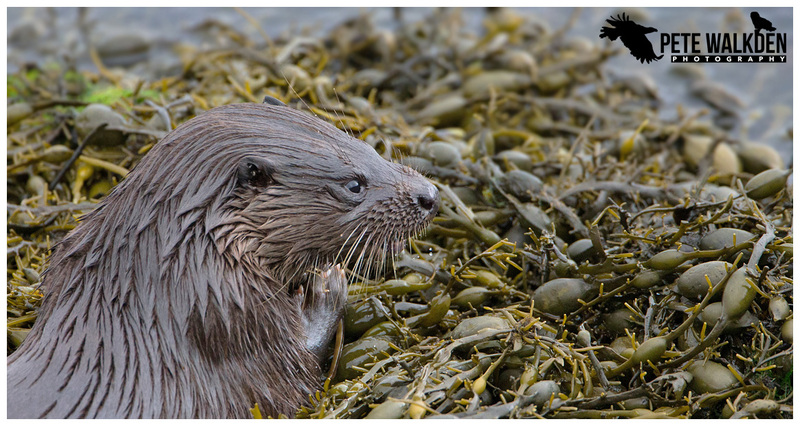 But then Ruth spotted one of the other otters much closer, and we all froze to watch. It was coming ashore, and we relocated to another viewpoint and collectively held our breath. It had caught a large crab, and landed it on a small seaweed-covered rock below us. We'd struck gold again! Despite us being so close, the otter wouldn't have heard our shutters clicking (on silent mode of course) as it crunched through the shell of the crab. 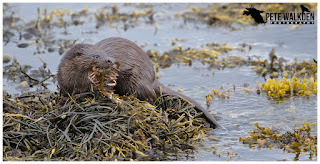 Remarkably, after such amazing views, we moved to another spot on the lochside, and got even closer views of an otter, as it fed on a fish it'd caught. I couldn't fit the whole otter in the frame! Needless to say, we stayed watching, and when the pair of young otters we had seen earlier came swimming over to the one below us, we wondered what we might see next. Alas a small movement from one of us spooked them, which was hardly surprising how close the otters had come to us, and they backed off slightly. Perhaps, for us at least, this was a good thing, as we were then able to photo the pair with a bit more space in the shot. More magic as we saw them swimming around, hugging each other. At times with one head stacked on the other. So charming. When they stopped playing and swam out into the water, we thought it was time to leave them be, and head elsewhere. It was getting busier on the roads, and more folks were slowing to look at what we were watching. It was also starting to rain pretty hard, as forecast. 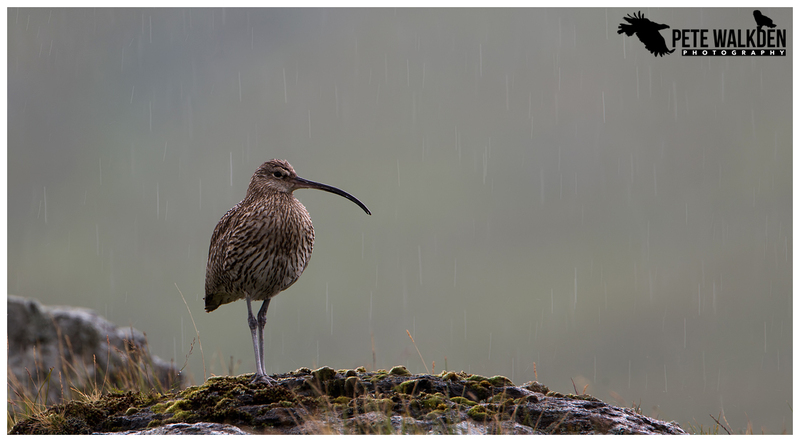 Around the loch, we saw a curlew perched on a rock, so I suggested we try for the slow speed shots to make the rain streak. Wasn't quite enough contrast to get the effect I wanted, but it wasn't bad. Back to the digs for a well earned cooked breakfast, before we headed north to visit Tobermory for a change. We were going to take a drive around the north west corner of Mull, but ended up looking for more otters elsewhere, but drew a blank. Saturday morning, and we had to be out of the accommodation by 10am. Andy and I busily tidied up, while our clients packed ready for their travel plans that day. As the house started to empty, as each left, both Andy and I felt a hint of sadness as the week had been such tremendous fun, and the wildlife had been incredible. I can't imagine how we could have had a better group of people as clients really. Everyone got on, shared an obvious passion for wildlife and photography, were more than willing to follow our guidance and definitely had similar senses of humour, all of which made the week fly by. 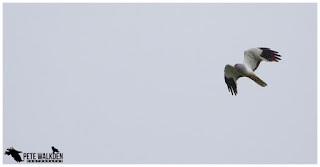 I had intended to stay for the Saturday in a vain attempt to photograph hen harriers, but the rain forecast for the evening rolled in mid-morning, and by mid-afternoon I was sailing away from Mull, with the long drive home ahead of me. Andy has run such tours before, so perhaps didn't have the apprehension I had before this one. I didn't know what to expect; would I even enjoy the challenge? Would it be successful? 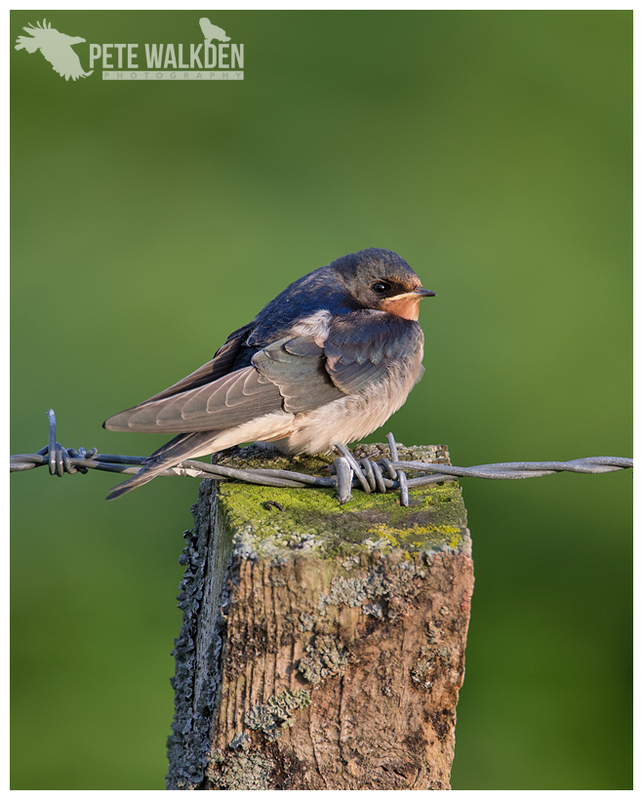 Could I successfully guide and advise others to enjoy and photograph the wildlife I have captured on camera over the years on this wonderful island? Now I know all of the answers, and am looking forward to running more tours. I loved every minute of it. To see the clients' faces light up when experiencing the action we witnessed, to hear them recount how they felt at seeing the wildlife, and to see the results on the back of their cameras, spoke volumes. Next July (2017) we will be running two tours, with the same target species and trips booked. If you fancy joining us, please take a look at Andy's website (Click Here), and sign up.